After the Revolutionary War and the establishment of the United States of America, the newly reorganized Columbia College Trustees elected as its third president, William Samuel Johnson, the Yale educated son of the College's first president, Samuel Johnson. A lawyer by training, Johnson was one of the first non-clerical college presidents in the United States. Under President Johnson's administration, Columbia's curriculum was revised and enlarged, new professors were added to the faculty of arts, the medical faculty was revived and a Professor of Law, James Kent, was appointed. 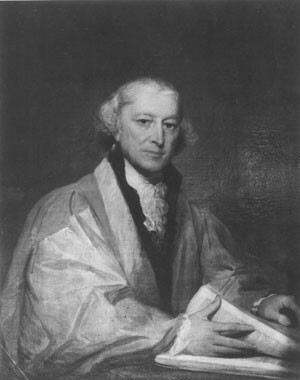 Prior to his election to head Columbia College, Johnson held various political and judicial offices, and, as delegate to the Constitutional Convention in 1787, was one of a committee on the literary style of the U.S. Constitution. In 1788, Johnson was elected U.S. Senator from Connecticut (1787-1791), an office he continued to fill in conjunction with the Presidency of Columbia until Congress was removed to Philadelphia. Concerned about his health, Johnson retired from the Columbia presidency to his home in Stratford, CT in 1800 at the age of seventy-three.